LUO Mingjun lives in Switzerland since 31 years. She is an artist who commutes between two different cultures. Previously, she obtained a complete academic education in Hunan province in China. In the early 1980s, when the 85 New Wave movement rose in China, young artists adopted the method of Western contemporary art and applied “readymade products” to their works by taking a pioneering attitude, subverting or criticising the concepts of obsolete art. 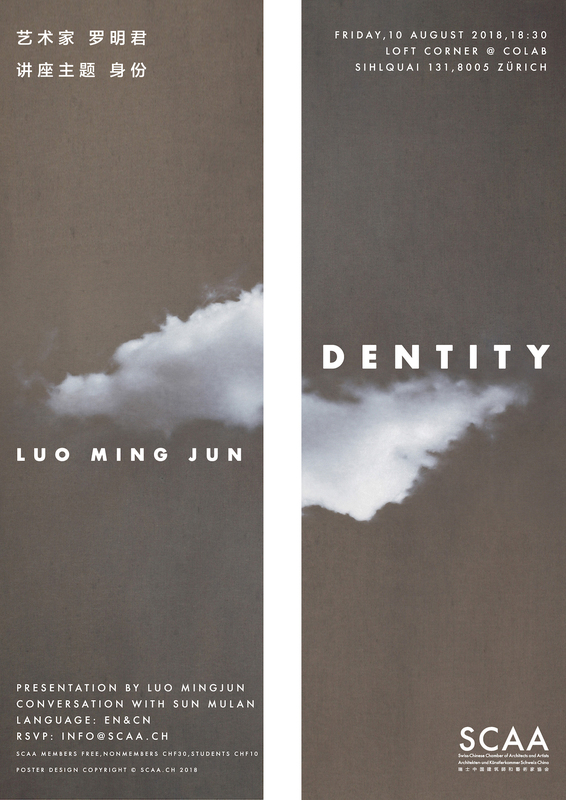 When Luo moved to Switzerland in 1987, while living and working in a foreign country, the inner conflict and anxiety of self-identity in the two different cultures became big subjects that the artist had to think about. Facing the transformation of ideology and cultural identity caused by two opposing cultural environments, she created an intermediate zone for her own dialogue and communication, a “Third Space”, or a “No Man’s Land” and got attention. Luo Mingjun will present the process and experience of her creation through the interpretation of some of her works in the lecture (with SCAA). Welcome to SCAA Book Reading Club! Sascha Roesler (Dr. sc. ETH) ist SNF-Förderprofessor für Architekturtheorie an der Accademia di architettura in Mendrisio. Seine Projekte sind an der Schnittstelle von Architektur, Ethnografie und Wissenschaftsforschung angesiedelt. Aktuell forscht er mit einem Team von Doktoranden und Postdoktoranden vergleichend zu Fragen der Klimatisierung als kultureller Praxis. Empirische Schwerpunkte bilden die Städte Santiago de Chile, Kairo (Ägypten) und Chongqing (China). 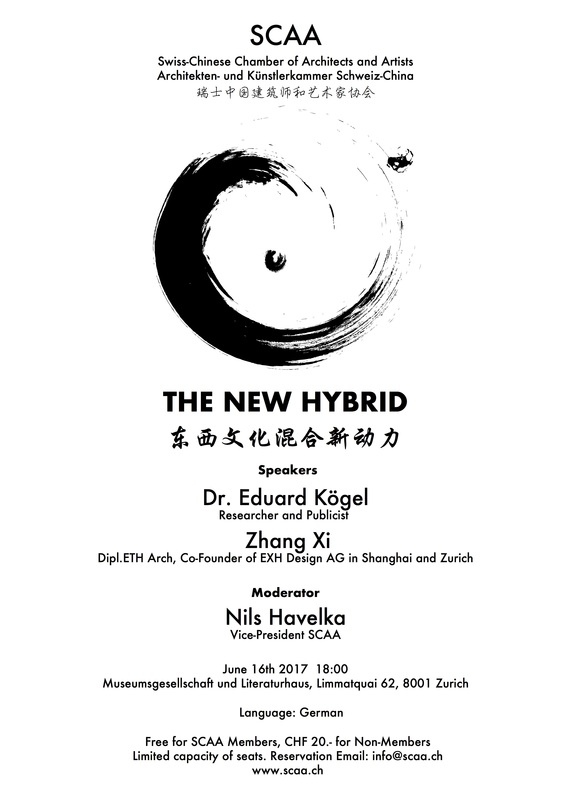 Vor seiner Zeit in Mendrisio war er als Dozent an der ETH Zürich sowie als Senior Researcher am Future Cities Laboratory in Singapur tätig. Er ist u.a. Autor der ersten Wissensgeschichte der ethnografischen Forschung der modernen Architektur (Weltkonstruktion, Berlin 2013) sowie Preisträger des Swiss Art Award in der Sparte Architektur. Andries Diener (Dipl. Arch ETH) ist verantwortlich für das Investment Management bei Diener Syz Real Estate und hat 17 Jahre Erfahrung in der Immobilien- und Bauindustrie in der Schweiz und in China. Vor der Gründung von Diener Syz Real Estate leitete er das Marketing von Schindler in China. Bevor er 2005 nach China zog, war Andries Diener Projektmanager des führenden Schweizer Immobilienentwicklers Nüesch Development und führte die familieneigene Baufirma Diener AG während der Neuausrichtung der Geschäftstätigkeit. Andries Diener spricht fliessend Mandarin und besitzt ein Diplom in Architektur der Eidgenössischen Technischen Hochschule (ETH) sowie ein MBA der INSEAD. Im Nebenamt ist er als Vorstandsmitglied der Gesellschaft Schweiz-China tätig. Tian Chiang (MSc. Arch ETH) ist Associate bei Mach Architektur GmbH. Mit ihrem Chinesisch-deutschen Hintergrund und ihrem Master Abschluss von der Eidgenössischen Technischen Hochschule (ETH) Zürich bringt Tian ein tiefgreifendes Verständnis für die Anpassungsfähigkeit einer Markenarchitektur an die verschiedenen Kulturen weltweit mit. 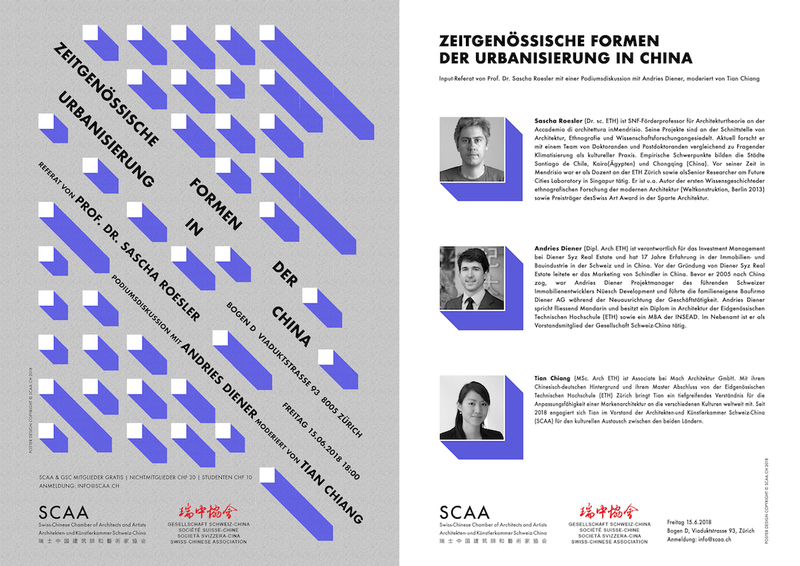 Seit 2018 engagiert sich Tian im Vorstand der Architekten-und Künstlerkammer Schweiz-China (SCAA) für den kulturellen Austausch zwischen den beiden Ländern. 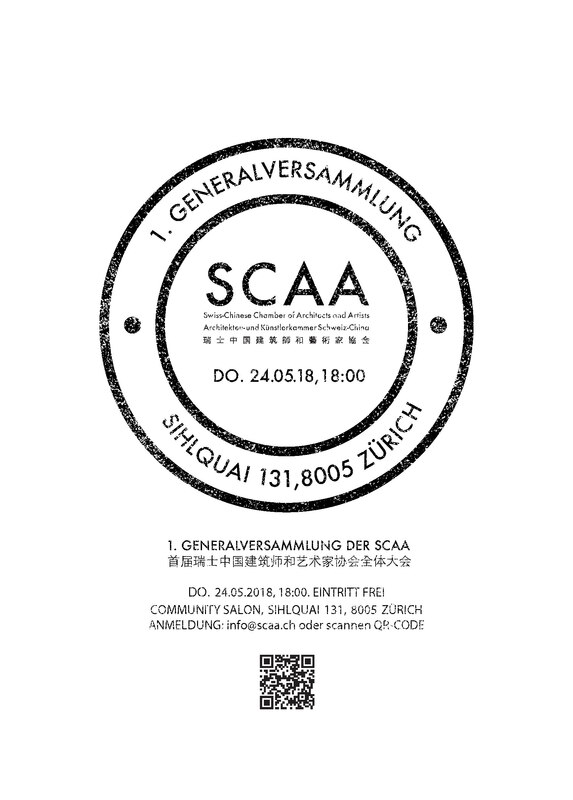 We would like to warmly invite you to attend the 1. general assembly of SCAA, which will take place on Thursday 24.5.2018 from 18:00 to 19:00 at Colab (Sihlquai 131, Zürich), follow up with aperitif. The agenda items will be sent to you soon by email. Please confirm your participation via Doodle before 18.05.2018. Look forward to seeing you on 24.May. Let’s shape the future of SCAA together! SCAA is honored to have the opportunity to host our April event in Werner Oechslin Library in Einsiedeln! You are kindly invited to join us! Werner Oechslin is professor of art history and architecture at the Federal Institute of Technology in Zurich (ETH). 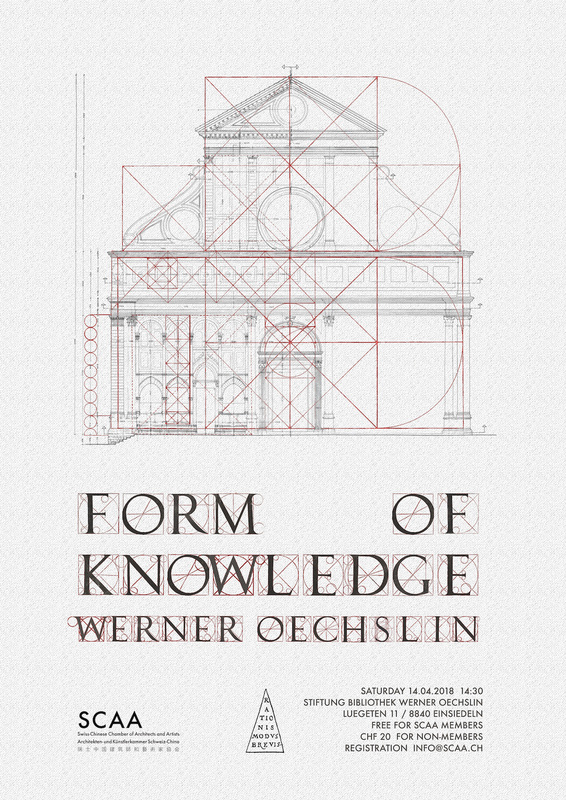 Werner Oechslin’s contributions on the history of art and architecture from the 15th to the 20th century have been widely published. He specializes in the theory of architecture, in Baroque, modern architecture and in 18th century as well as in specific problems of architectural drawing and typology and of ephemeral architecture. He is the founder of the “Stiftung Bibliothek Werner Oechslin” in Einsiedeln, that organizes since 1999 the annual international Baroque summer course and publishes the bulletin „Scholion”. The Library The library of the art and architectural historian Werner Oechslin consists of about 50000 books dating back over six centuries. The emphasis is on primary sources about architecture and architectural theory. Other important subjects related to architecture, such as philosophy, mathematics, art, archeology and history, are also well represented. It is conceived as a research library which reveals contexts in culture and the humanities. Thus it belongs to the tradition of those libraries which – through the presentation and placement of the books (in the sense of Kant’s ‘architectonic’ as an ‘art of the systems’) – represent a form of knowledge. The individual and the whole, the meaningful and the unusual all play equally important roles. The Foundation was established in 1998. Built according to plans drawn up by Mario Botta and Werner Oechslin’s ideas, the library was inaugurated in 2006 and since then has been open to researchers. According to the Foundation’s mission to make significant contributions to international research, conferences, symposia and colloquia are organized on a regular basis. The Foundation’s scholarly staff regularly cooperates closely with universities, particularly with the ETH Zurich which provides basic services and guarantees the library’s ties with research and teaching in its Department of Architecture. Wir werden während dem Event nicht nur die chinesische Teekultur kennen lernen, sondern auch zwei verschiedene Teeräume erleben, bzw. Chinesischen Teeraum und Japanischen Teeraum. 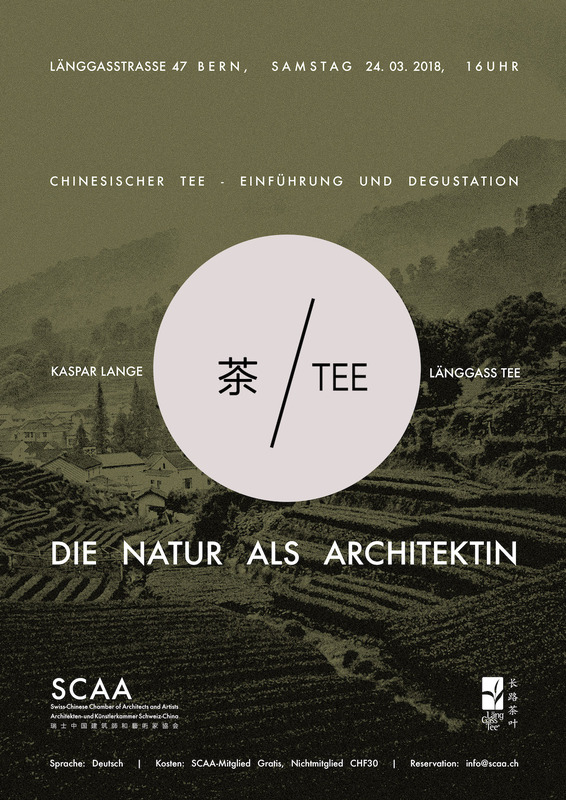 SCAA freut sich Dich am 24.3 in Länggass Tee in Bern zu begrüssen! Am 16.Februrar 2018 feiert man nach dem chinesischen Mondkalender Neujahr – den Beginn des . 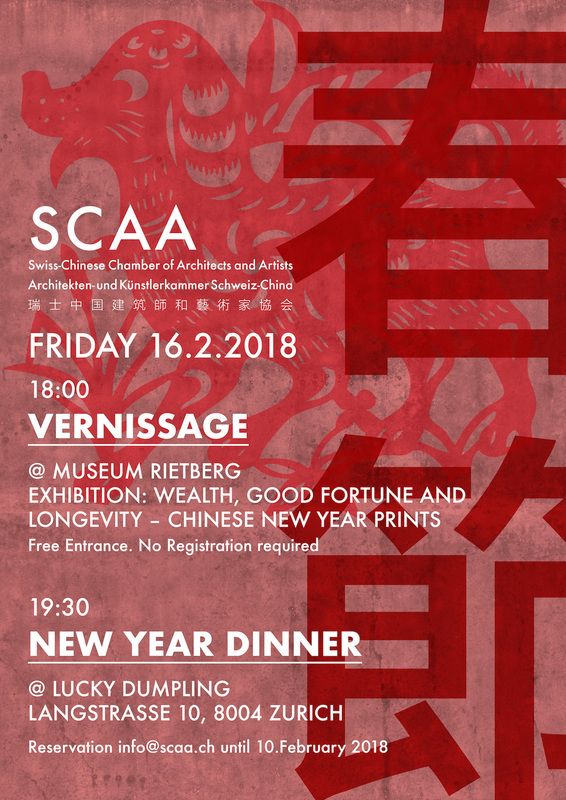 SCAA freut sich mit Ihnen/Euch das Chinesische Neujahr im Museum Rietberg zu feiern. Anschliessend gehen wir gemeinsam essen im Restaurant Lucky Dumpling. 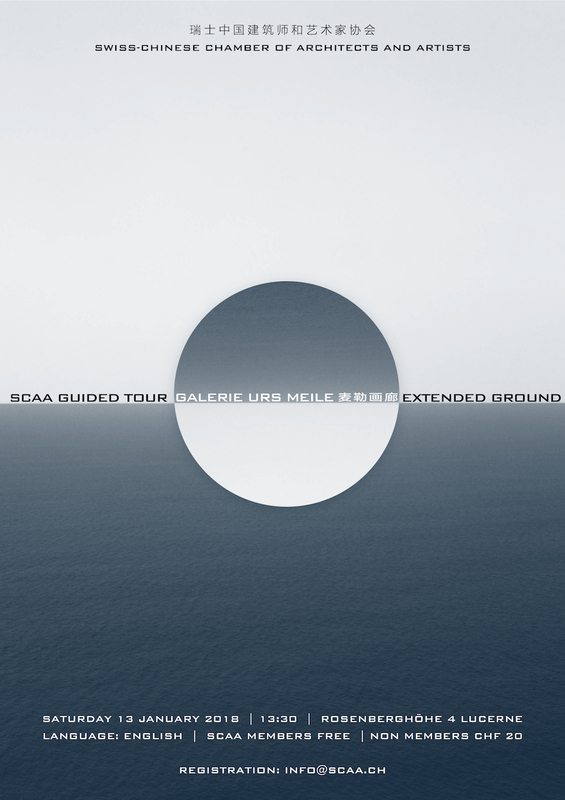 SCAA will organise a guided private tour in Galerie Urs Meile to open the first event in 2018! Since its establishment in 1992, Galerie Urs Meile has contributed to the presentation and dissemination of contemporary art, from painting and sculpture to photography, installation and video. The gallery is working from two locations: Lucerne (Switzerland) and Beijing (China). While its center of operations is based in Switzerland, the Beijing gallery has established itself as an international meeting place for collectors, curators, artists and aficionados of the arts. Galerie Urs Meile was one of the first international galleries to focus on the Chinese art scene and has been working on an international level with Chinese artists since 1995. Der Schweizer Uli Sigg hat in der Phase der wirtschaftlichen Öffnung Chinas nach der Mao-Zeit eine wesentliche Rolle gespielt, und er trug die bedeutendste Sammlung Chinesischer Gegenwartskunst zusammen. Der grösste Teil davon wird dem Museum M+ in Hong Kong übergeben, welches 2019 eröffnet wird. Eva Lüdi Kong, geboren im Jahr 1968, ist eine Schweizer Sinologin. 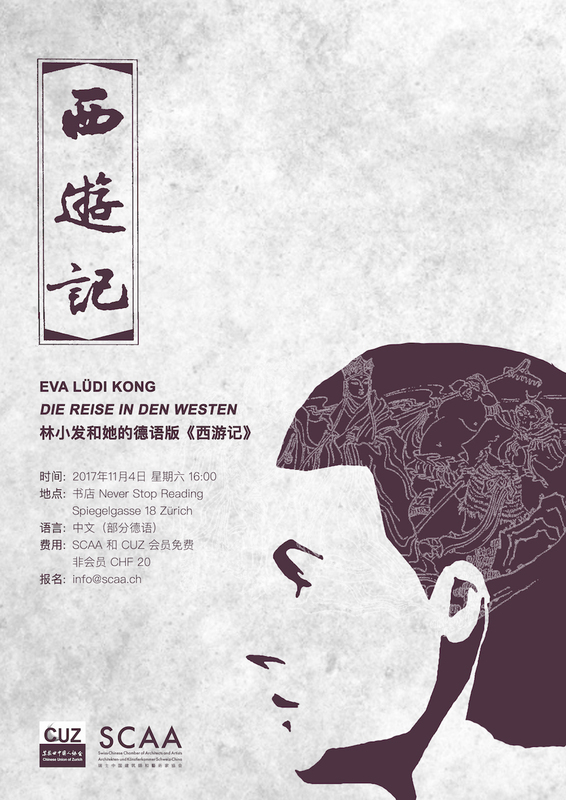 Die Liebe zu der chinesischen Sprache führte sie zur Fachrichtung Sinologie an der UZH, darauf folgten 1996 ein Studium der Kalligraphie und Druckgraphik an der China Academy of Art (BA) und 2004 ein Nachdiplomstudium der Klassischen Chinesischen Literatur an der Zhejiang University (MA) in Hangzhou. 1990 bis 2016 lebte Eva Lüdi Kong in China und arbeitete dort unter andrem als Hochschuldozentin. 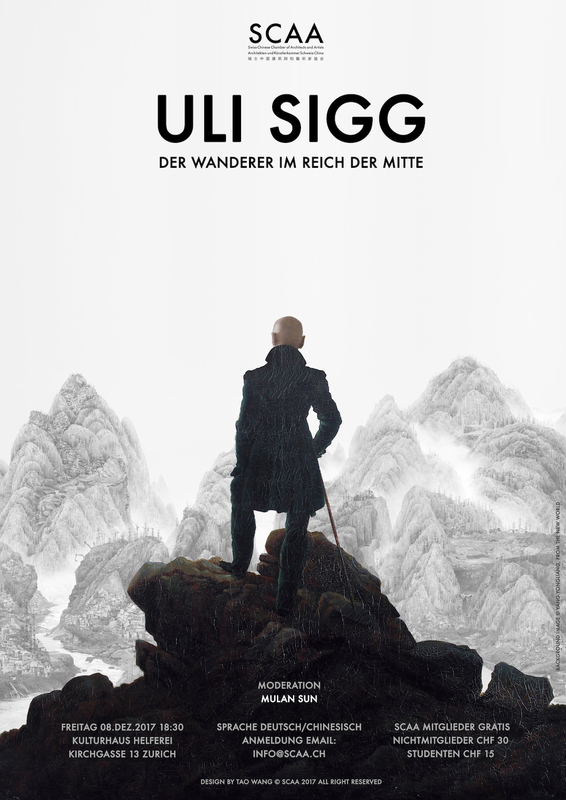 Im Jahr 2016 zog die Bielerin in die Schweiz zurück und ist heute als freischaffende Literaturübersetzerin und Kulturvermittlerin im Bereich chinesischer Literatur und Philosophie tätig. 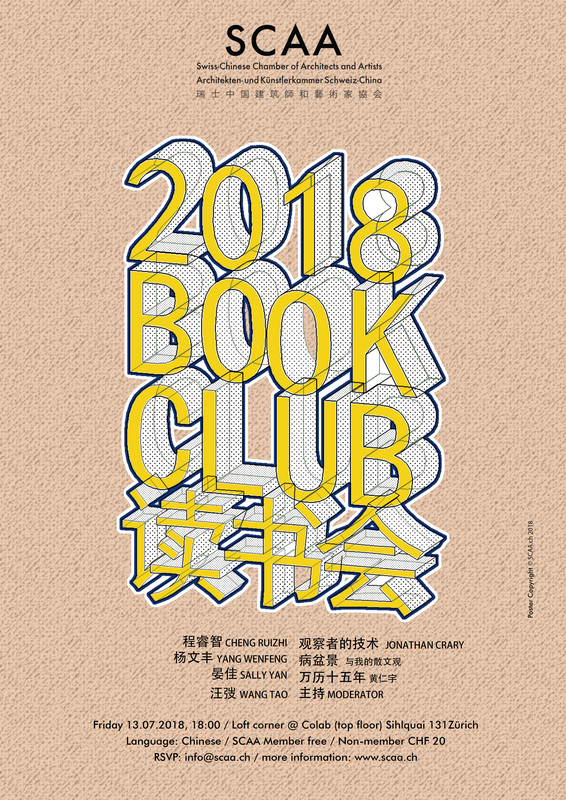 Für die erste vollständige deutsche Übersetzung des klassischen chinesischen Romans <Die Reise in den Westen> erhielt sie 2017 den Preis der Leipziger Buchmesse. The Museum Rietberg owns one of Europe’s most important collections of Chinese art, with a focus on Buddhist sculpture, funerary art (bronzes, jades, ceramics), and painting from the Ming and Qing dynasties (1368–1911). The long-term loan of the world-famous Meiyintang Collection of Chinese ceramics has greatly added to its reputation. Over more than five decades, the brothers Gilbert and Stephen Zuellig have brought together one of the most important private collections of Chinese ceramics in the world, which is known under the name Meiyintang, „Hall among Rosebeds‟. Through their life and their business in the Far East, they developed a wide-ranging passion for Asian art and culture. Around 1960 the brothers began to build a systematic collection of Chinese art. 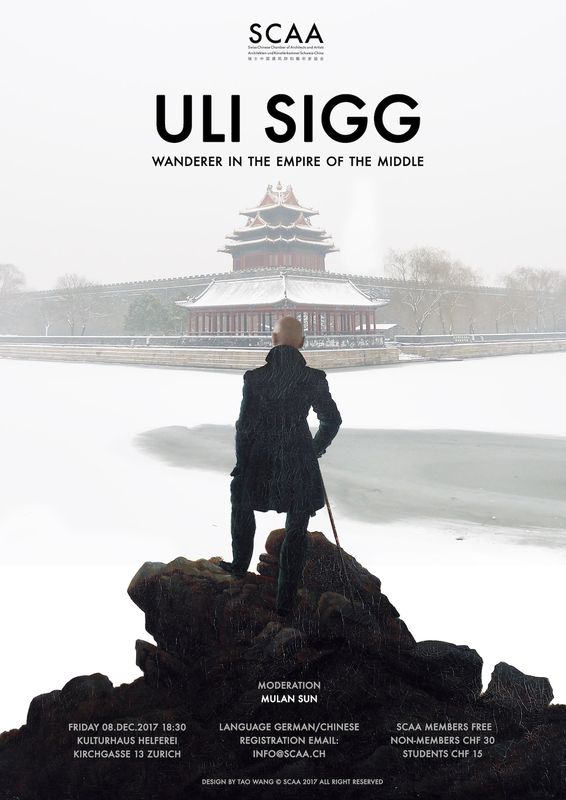 Gilbert Zuellig specialised in early ceramics from the Neolithic period through the Han and Tang dynasties to the Song dynasty (5th millennium BC to 1279) while Stephen collected porcelain of the later dynasties (Yuan, Ming and Qing). For specialists and lovers of Chinese ceramics, but also for a wider audience it is a stroke of luck that the older part of the collection which was transferred to a foundation is now publicly accessible. 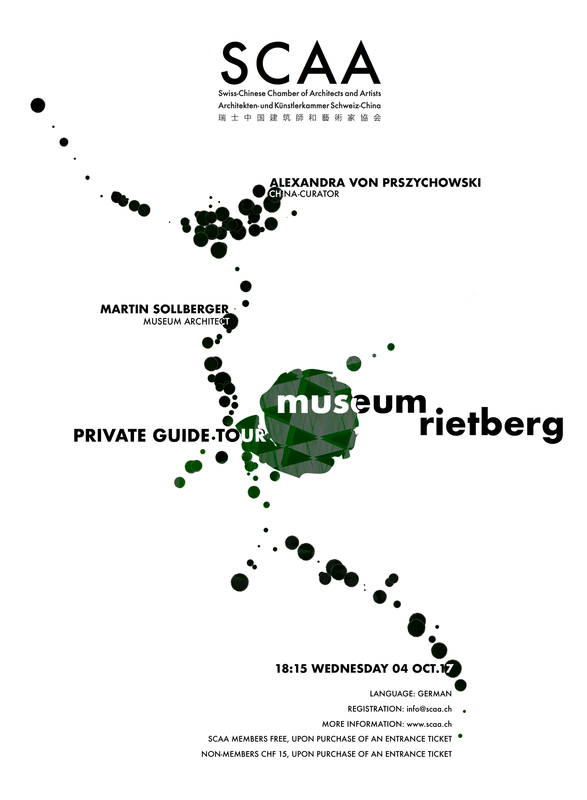 The Meiyintang Foundation and the family of Gilbert Zuellig (1918–2009) have ensured that this eminent collection is maintained in its entirety by lending it to the Museum Rietberg as a long-term loan. In addition, the Foundation will cover the expenses incurred by the refurbishing of the China galleries. The existing rooms in the Emerald pavilion were completely rebuilt and redesigned over six months. For the presentation of the ceramics in floor-to-ceiling display cases, a novel exhibition concept was developed using LED luminaires thanks to which the different shapes and glazes of the ceramics are highlighted in an ideal way. Benjamin Krüger is an architect and photographer. 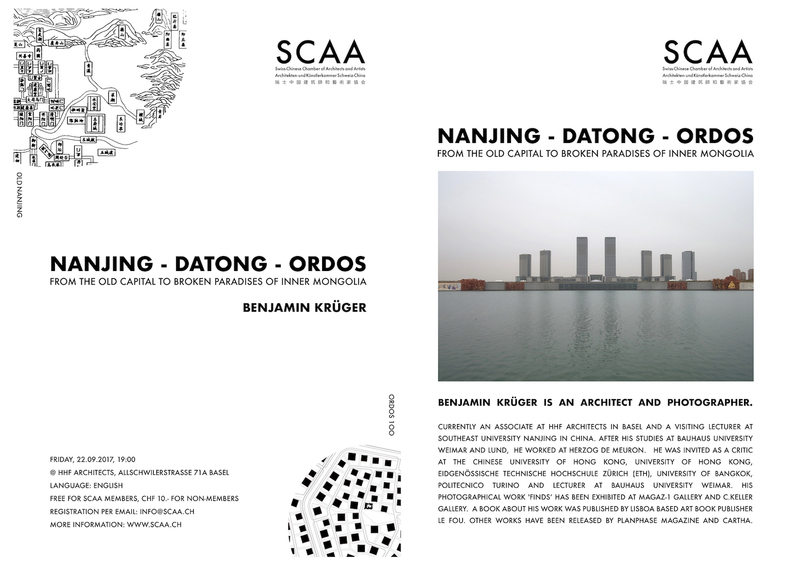 Currently an associate at HHF architects in Basel and a visiting lecturer at Southeast University Nanjing In China. After his studies at Bauhaus University Weimar and Lund, he worked at Herzog de Meuron. He was invited as a critic at the Chinese University of Hong Kong, University of Hong Kong, ETH Zürich, University of Bangkok, Politecnico Turino and lecturer at Bauhaus University Weimar. His photographical work ‘finds’ has been exhibited at Magaz-1 gallery and C.Keller gallery. A book about his work was published by Lisboa based art book publisher Le Fou. Other works have been released by Planphase magazine and Cartha. Click the image above to download the poster. 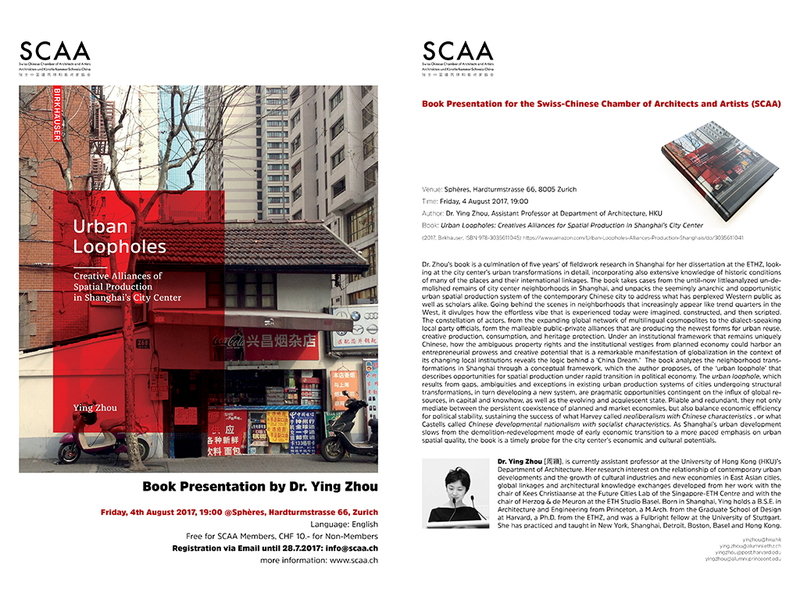 Dr. Zhou’s book is a culmination of five years’ of fieldwork research in Shanghai for her dissertation at the ETHZ, looking at the city center’s urban transformations in detail, incorporating also extensive knowledge of historic conditions of many of the places and their international linkages. 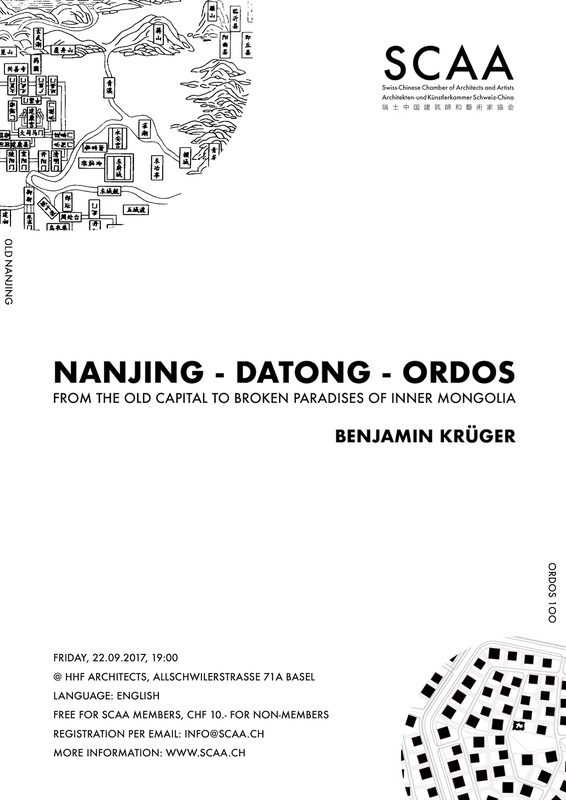 The book takes cases from the until-now little-analyzed un-demolished remains of city center neighborhoods in Shanghai, and unpacks the seemingly anarchic and opportunistic urban spatial production system of the contemporary Chinese city to address what has perplexed Western public as well as scholars alike. Going behind the scenes in neighborhoods that increasingly appear like trend quarters in the West, it divulges how the effortless vibe that is experienced today were imagined, constructed, and then scripted. The constellation of actors, from the expanding global network of multilingual cosmopolites to the dialect-speaking local party officials, form the malleable public-private alliances that are producing the newest forms for urban reuse, creative production, consumption, and heritage protection. Under an institutional framework that remains uniquely Chinese, how the ambiguous property rights and the institutional vestiges from planned economy could harbor an entrepreneurial prowess and creative potential that is a remarkable manifestation of globalization in the context of its changing local institutions reveals the logic behind a ‘China Dream.’ The book analyzes the neighborhood transformations in Shanghai through a conceptual framework, which the author proposes, of the ‘urban loophole’ that describes opportunities for spatial production under rapid transition in political economy. The urban loophole, which results from gaps, ambiguities and exceptions in existing urban production systems of cities undergoing structural transformations, in turn developing a new system, are pragmatic opportunities contingent on the influx of global resources, in capital and knowhow, as well as the evolving and acquiescent state. Pliable and redundant, they not only mediate between the persistent coexistence of planned and market economies, but also balance economic efficiency for political stability, sustaining the success of what Harvey called neoliberalism with Chinese characteristics, or what Castells called Chinese developmental nationalism with socialist characteristics. 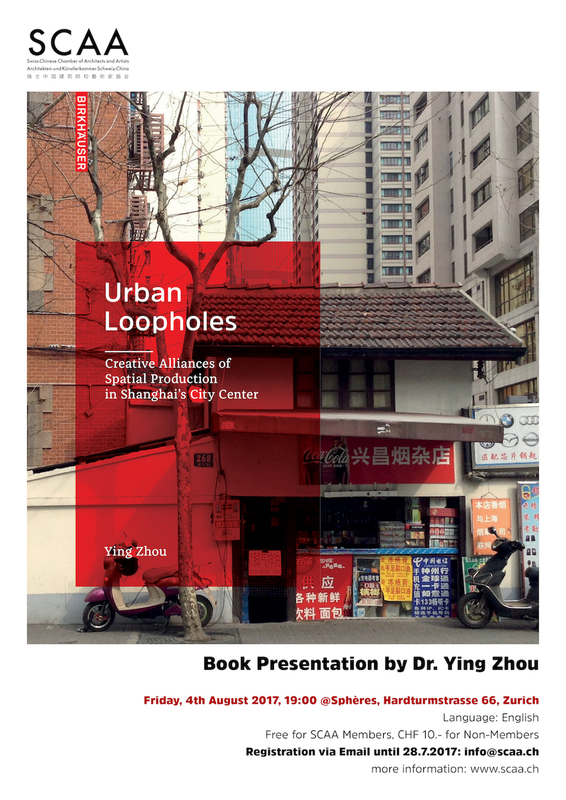 As Shanghai’s urban development slows from the demolition-redevelopment mode of early economic transition to a more paced emphasis on urban spatial quality, the book is a timely probe for the city center’s economic and cultural potentials. 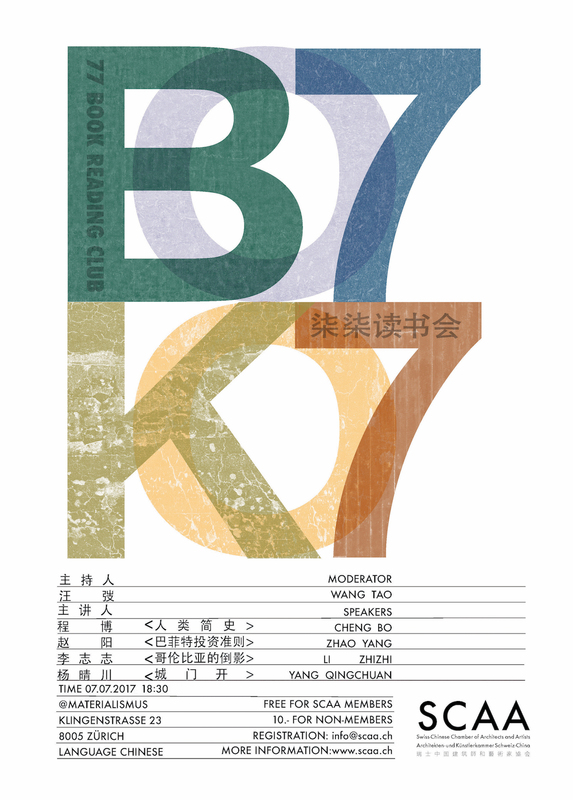 Dr. Ying Zhou [周穎], is currently assistant professor at the University of Hong Kong (HKU)’s Department of Architecture. 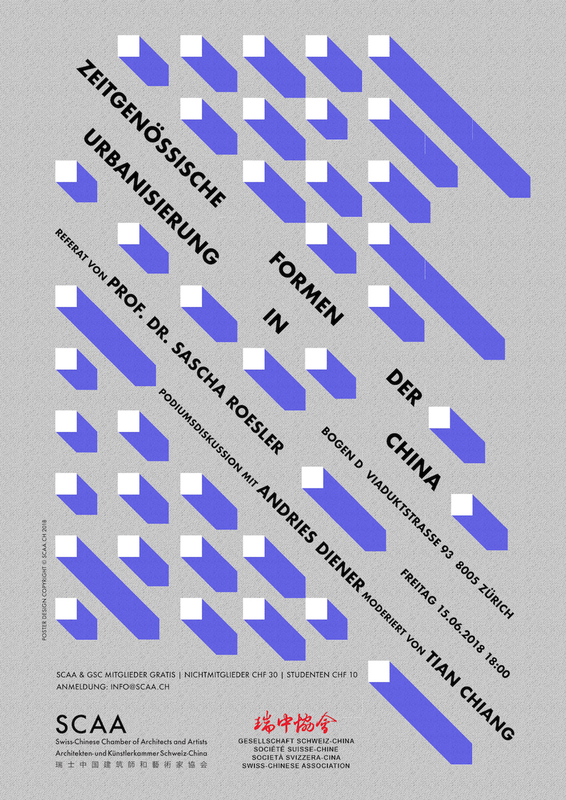 Her research interest on the relationship of contemporary urban developments and the growth of cultural industries and new economies in East Asian cities, global linkages and architectural knowledge exchanges developed from her work with the chair of Kees Christiaanse at the Future Cities Lab of the Singapore-ETH Centre and with the chair of Herzog & de Meuron at the ETH Studio Basel. Born in Shanghai, Ying holds a B.S.E. in Architecture and Engineering from Princeton, a M.Arch. from the Graduate School of Design at Harvard, a Ph.D. from the ETHZ, and was a Fulbright fellow at the University of Stuttgart. She has practiced and taught in New York, Shanghai, Detroit, Boston, Basel and Hong Kong. 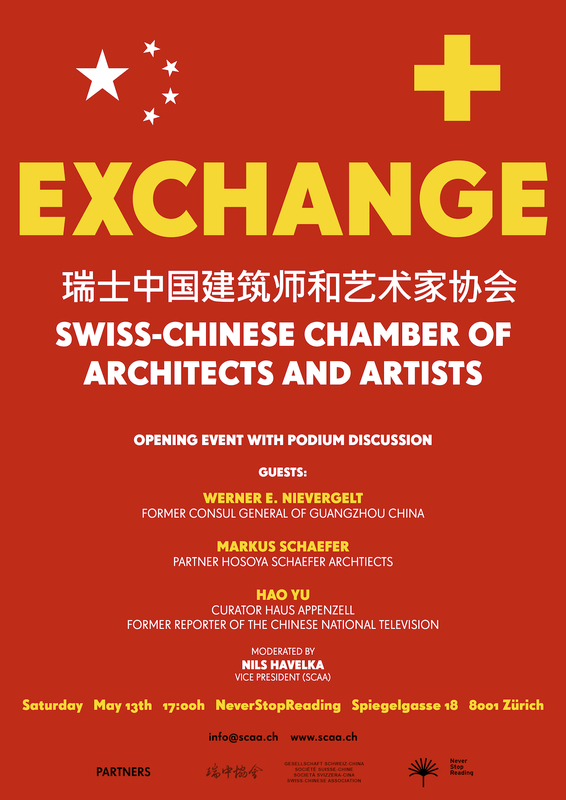 Podiumsdiskussion mit Werner E. Nievergelt, Kulturvermittler, Markus Schäfer, Architekt, und Hao Yu, Kuratorin. Die Veranstaltung dauert ca. 75 Minuten. Anschliessend lassen wir den Abend bei einem Apéro ausklingen. Die Veranstaltung findet auf English statt. Die SCAA freut sich Sie/Dich zur Teilnahme der Veranstaltung einzuladen. Anmeldung via info@scaa.ch spätestens bis zum 5. Mai 2017.